We are a friendly community bar with Great pub grub. 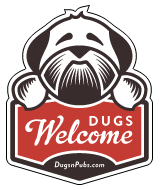 Dogs are very welcome. The only restrictions are that we request for your dog not to sit on the seats and to also keep them on a lead. Family & Dog Friendly French Cafe Wine Bar. Serving french cafe favourites like freshly made Crepes, Croque Monsieur, Moules Mariniere, Sharing Boards, Steaks, Burgers, Soups, Artisan Breads & Pastries, Finest Coffees, Loose Leaf Teas, Wine, Beer & Champagne. Open 8am to 1am 7 days a week. Pic: Jaffa in Café Tartine – from Sydney Arber. There are a total of 57 dog friendly listings in the EH6 category. Please log in, or sign up as a member to view all listings.